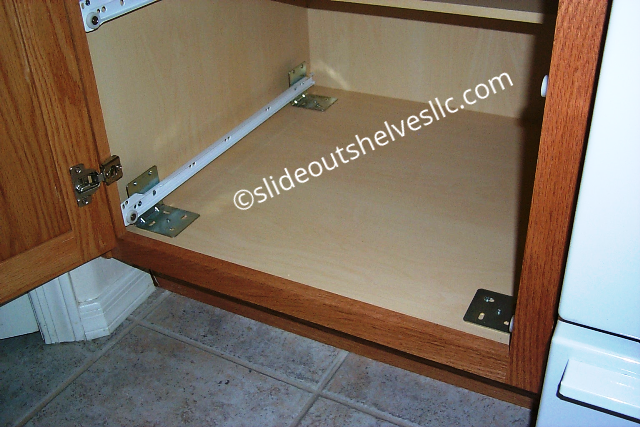 Total drawer side height: 2 3/8"
Well built; exactly what we needed; I need ideas how to protect the slide so it will not mar the inside of cabinet door. Any feedback from vendor is welcome. We are very pleased with the shelves we ordered and installed. A quality product that makes kitchen life a little easier for a senior home maker. We received the order within two days from the date of order and everything was packaged very well which allowed the products to arrive without damage. Your installation videos are very informative. 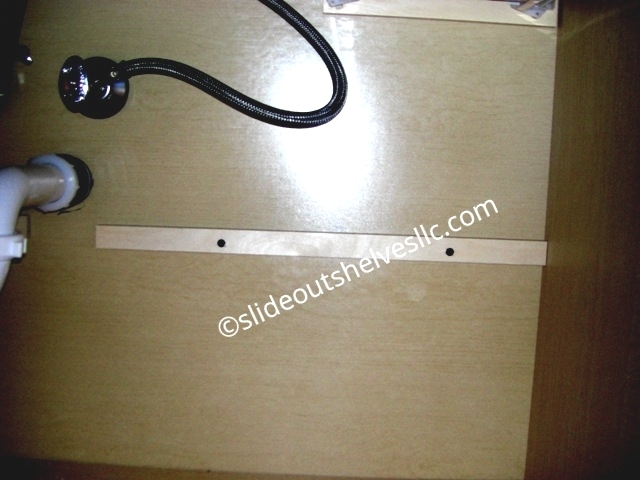 However, many of us are retrofitting our cabinets with these slide out shelves and the counter tops are already on the cabinets so it makes for a tighter squeeze when inserting screws into the rear mounting brackets. 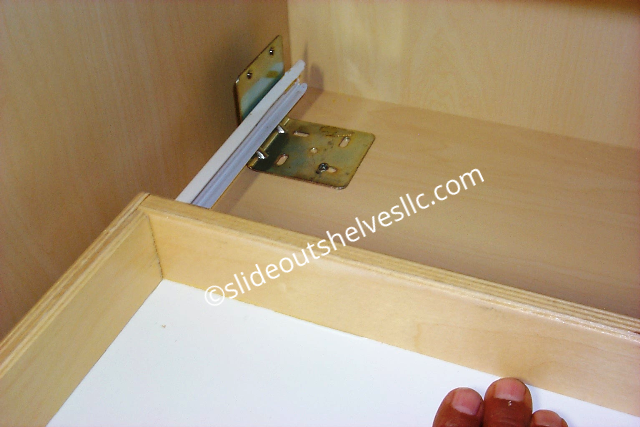 I highly recommend your product to anyone who may be thinking of installing slide out shelves. They arrived real fast, are well made and easy to install. A great way to upgrade your cabinets and make your cook very happy. Will be ordering more in the near future. Shelfs are very well made. However the bottom mount brackets are not made to attach to the slides I bought, I will gave to modify them to work. Received and installed. Exactly what we wanted. Quality is excellent and installation easy. 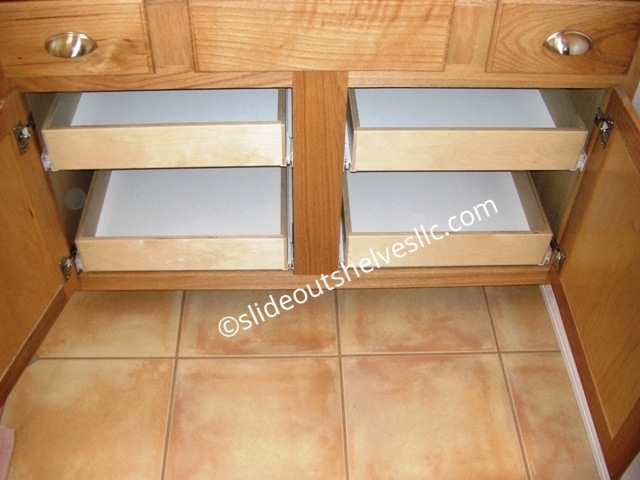 All lower cabinets should have slide out shelves, gives you total access without having to kneel on the floor to retrieve a pot, pan or bowl. Well made shelf's and we really like them. 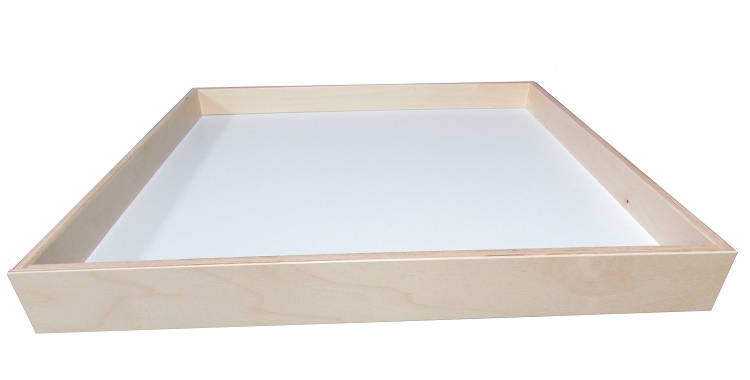 The slide out shelf I ordered was exactly as presented on the website. The custom fit was PERFECT and the quality was exceptional. Installation was easy, with all required parts included. I would definitely recommend this product and will purchase again. Wish I had ordered it slightly deeper. Otherwise it is perfect and it was super easy to install. Even for a lady! Better than expected! Beautiful craftsmanship and excellent functionality. With the pull out drawers I was able to add an additional shelf in the same space. If I were to order again I would likely add the self close option. I am very pleased with the price and quick delivery. The drawers came with all the installation hardware I needed. I could have saved a few vertical inches if I went with side mounts but happy with the super easy installation of the shelf mounts. The process was easy as I asked a lot of questions before I placed the order. 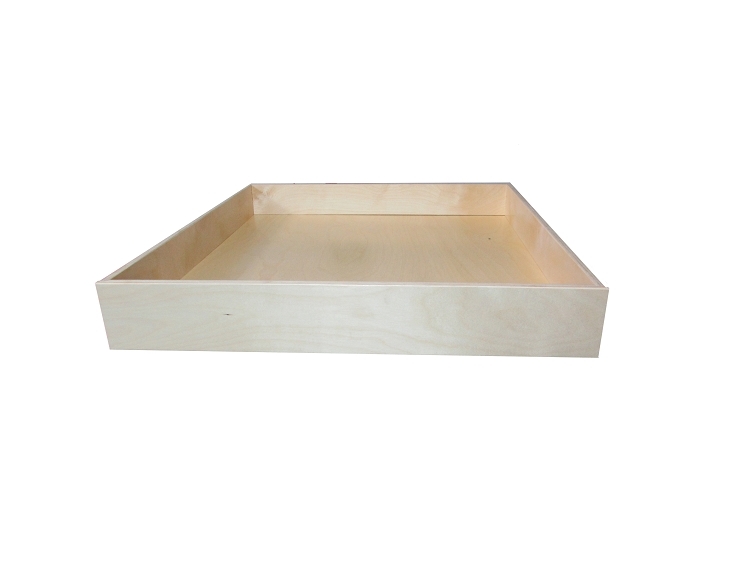 The pull out shelves are very well made and dimensionally correct. The shelves were very well packed and arrived with no damage. The hardware package was good, but a few extra screws would have been nice. However, there were no instructions included so I had to look at their video, I finally figured out how to install. Instructions would of have good to have. All in all, an excellent product. My second kitchen with them. Overall, I am very pleased with the 16 shelves I ordered and have installed in the the base kitchen cabinets in a home we recently purchased. The shelves look very good and give every indication of being well made. I am a middle level skill do it yourselfer. 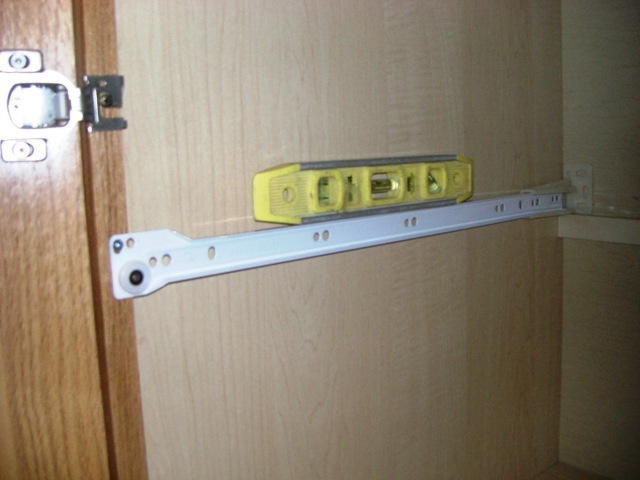 I watched the videos and was able to install the shelves satisfactorily. I ordered soft close sliders on the first batch of selves. One did not work properly. 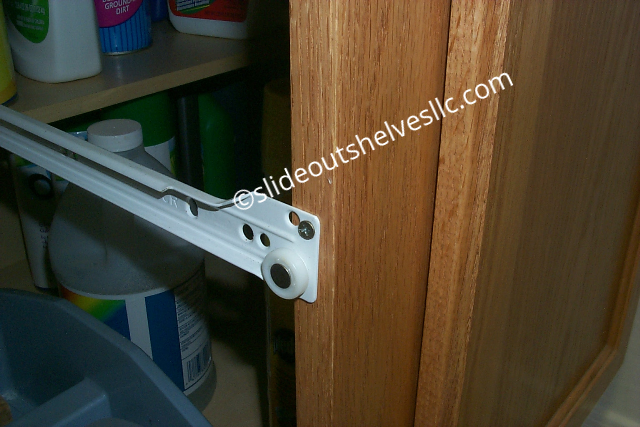 The people at Slide Out Shelves offered their advice and gave me a credit when we could not solve the problem. On the second batch of shelves I opted more simply for the full extension sliders. My two orders were promptly completed and shipped. UPS got the cabinets by ground from Arizona to Ohio in four days--pretty impressive. 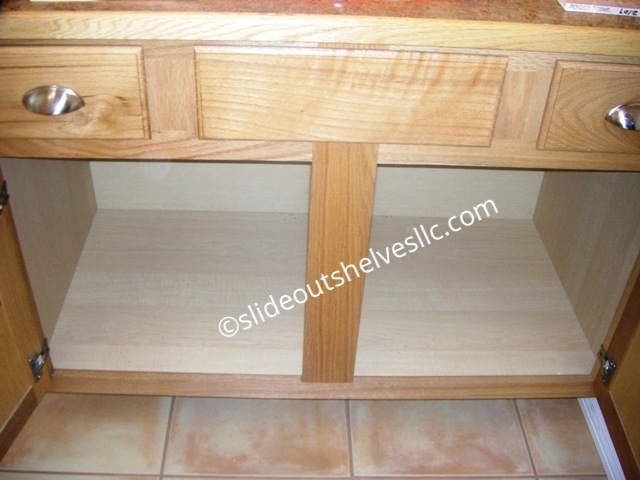 It's a big improvement for our kitchen to have slide out shelves in all of our base kitchen cabinets. Five stars out of five. 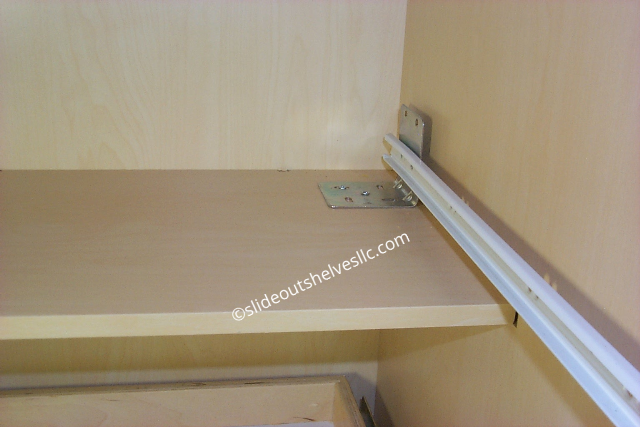 We bought two pull out shelves,full extension,base mount mounted to full shelf. They are very well made and worked perfectly. Narration with the instructional videos would be helpful.. Very pleased with the results. Exactly as described, sturdy, well packaged and delivered promptly. 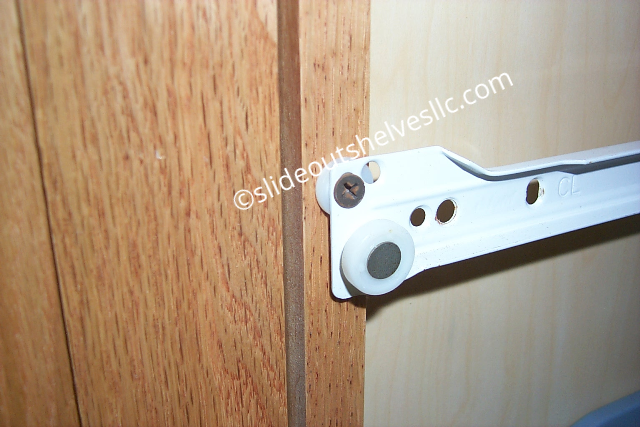 Good quality, easy to install , easily slide out. Absolutely a quality product and arrived in four days. 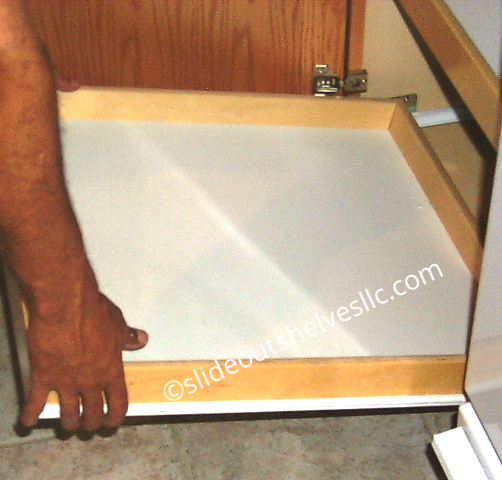 They are made and cut perfectly and provide so much convenience particularly in low shelf areas in the kitchen where you don't have to get on hands and knees to see what may be in the back since these slide out. I have already over the past 5 years already put over 15 of these slide-out shelves in and will probably be ordering more. My daughter saw mine and has put 6 in her home so far. Our neighbors also have put these in after seeing ours. Thanks for an extremely well-made product!! I purchased the shelves because all the cabinets in my house had full extension pullout shelves except 2 - that had no shelves at all. 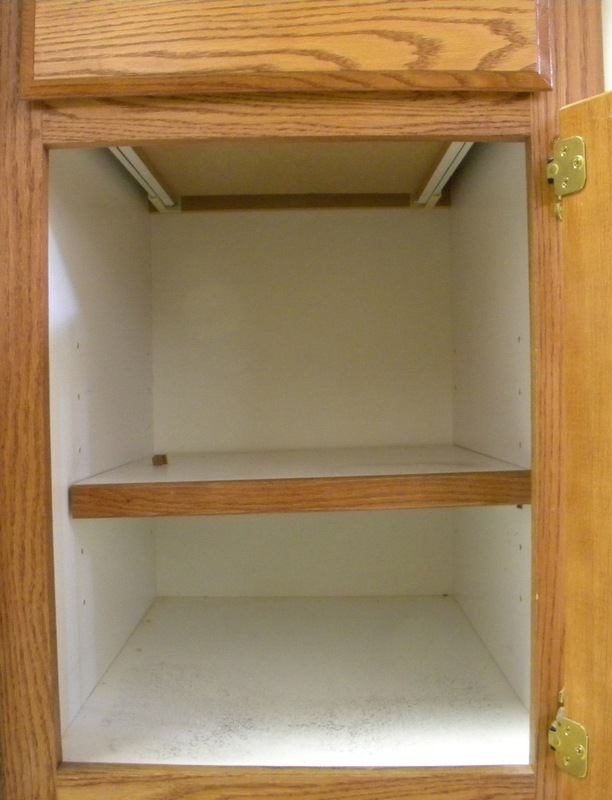 I wanted the convenience of the other cabinets in these 2 as well. I ordered 2 shelves per cabinet (4 total), one for the bottom and one about 1/2 way up. The package arrived in good condition and for a custom order very quickly. The shelves were well packed. In my "non-professional" opinion they appear to be very well built. Nice tight seams, rigid construction, nice finish. I was quite pleased with their overall appearance. 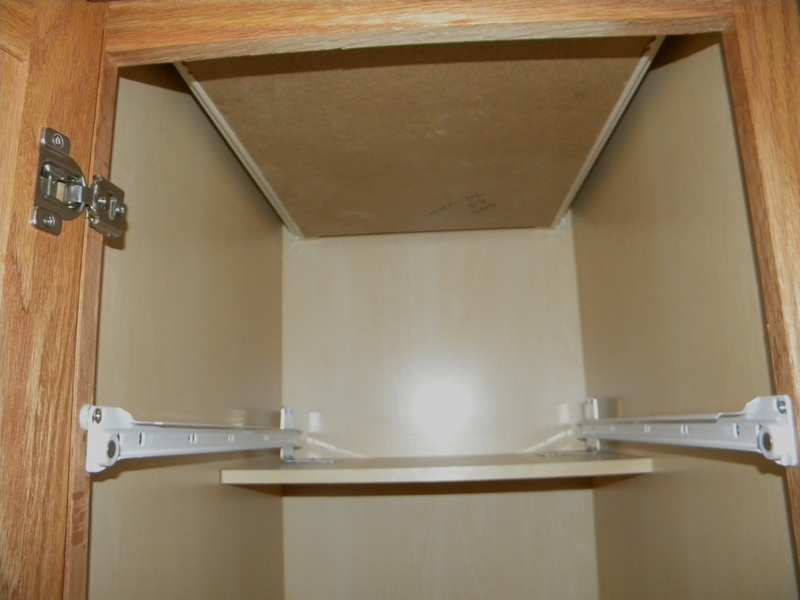 They closely matched the existing shelves in my other cabinets. Installation was very easy. 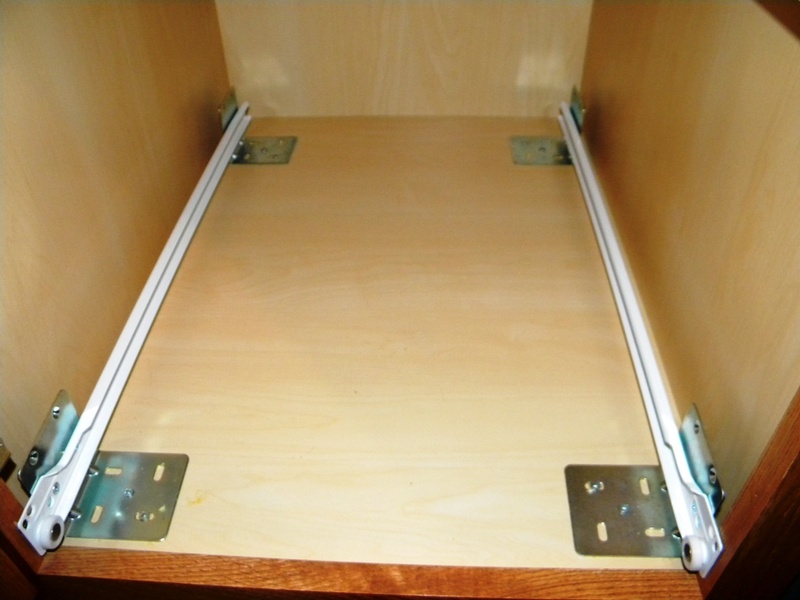 The most time consuming part for me was building side mounting cleats to clear the hinges and door on one side of the cabinets. In my case I needed to build out 1-5/8". That took 3 days, mostly waiting for glue and paint to dry. The actual installation of the cleats and shelves only took about an hour or so per cabinet. I would guess a real pro could have done it in half or a third of the time it took me. Follow the measurement guide, it works. Read all of it, even for the styles that differ from yours. The shelves themselves would have missed the hinges so I could have cheated a little on width but anything placed on the shelf would have to be offset to miss the hinges as well so I didn't cheat. An installation video for side mounting full extension shelves would be nice. All the videos are for bottom and rear mounting. As it was I had existing shelves to use as a guide so I had no trouble doing it myself. Based upon my initial inspection I fully expect these shelves to hold up well over the next few years. I would recommend them and would purchase them again for another project. Great product,the shelves work great and look good.Best of all they are not made in China.I will pass this information to all my friends. We ordered 5 shelves and they arrived 2 days later, very fast delivery. There were no instructions in the box, but I checked the website and there are easy instructions with videos. They were easy to install and they work great. I'm glad we found this website and ordered these shelves. They are quality shelves and work great. The pull out shelves I ordered came in four days from when I placed the order. They were perfect in every detail. I installed them in about two hours, which even surprised me. My wife loves them, and now I am on tap to order more for the rest of our cabinets. This is the second house that I have installed pull out kitchen shelves in both the bathrooms and the kitchen. I will be back for more. This is my fourth order (I think) from Slide Out Shelves, and I have never been disappointed. Quality is great, service, is great, order accuracy is great.....it's all great! 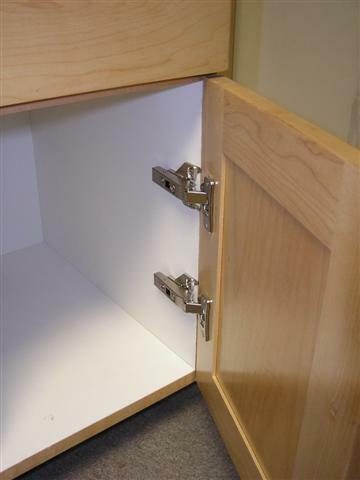 Another nice thing is that if something in your kitchen changes and you need to modify the size of a drawer, you can do it if you have some basic tools and are reasonably handy with them. I've done that at least three times. 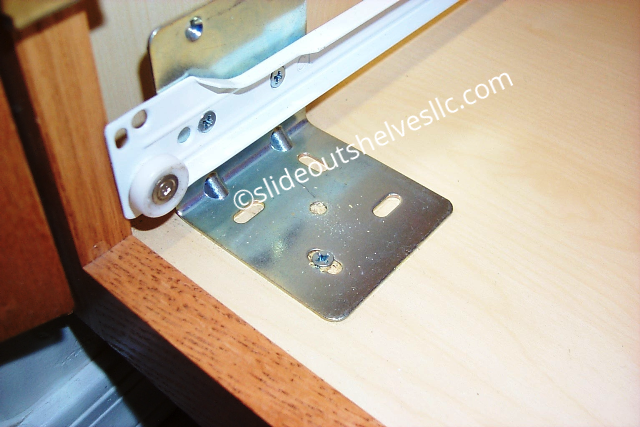 I purchased slide out shelves a few years ago and loved them. Recently we moved and bought them for our base cabinets. The online videos made the process easy. Love these shelves. This is my second time ordering from slide out. Shelves fit perfectly, install was easy - had all 5 installed in under 30 min. The birch finish looks great and matches our cabinets - couldn't be more happy - thx! 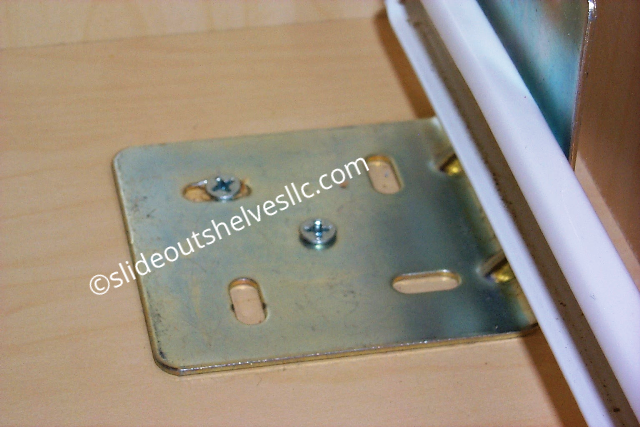 Great pull out shelf and the helpful videos made for very easy installation. The quality and workmanship is excellent and the price is great. It beats anything I saw at Home Depot or Lowes, and it's custom made. What more could you ask for. They slide so nice. My wife loves them. They also match the interior cabinet color. Two thumbs up! Website very clear on how to measure for shelves. Plenty of options for materials too. Shelves arrived in a couple of days. Shelves were just as ordered and materials and construction are top notch. Installation was straightforward. I am completely happy with the finished product! I am pleased with my purchased and the ease of installation. 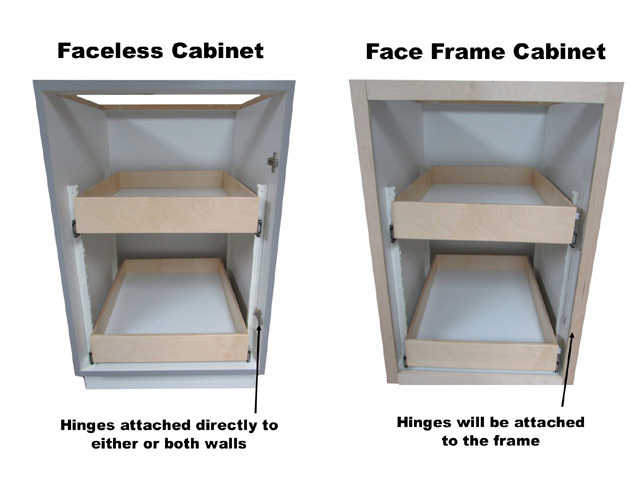 The 4 drawer shelve installation has tripled the storage space in our double cabinets I was disappointed that 2 of the guide rails were damaged (bent) in shipping. Fortunately I was able to straighten them out so that I did not have to ask for replacements. This is why only 4 stars. The packaging for shipment needs to be improved. The drawer box was perfect for my installation project. It was affordable, it freed up my time in the shop making my own and its the same cost I would have changed my customers. A couple of the shelves were tweaked in shipping, so I had a little trouble getting the 1st one to operate correctly. I got a piece of plywood out and mounted the slide-outs to it to get them to work properly prior to installing them in the cabinet. This worked well and now they all work beautifully and the wife is very happy. I ordered some door protectors and they only sent me half the screws, and I was short 1 screw for the installation of the slide-outs. It would be nice if they threw in a couple extras. The boxes are very nicely constructed and I will be ordering more very soon. 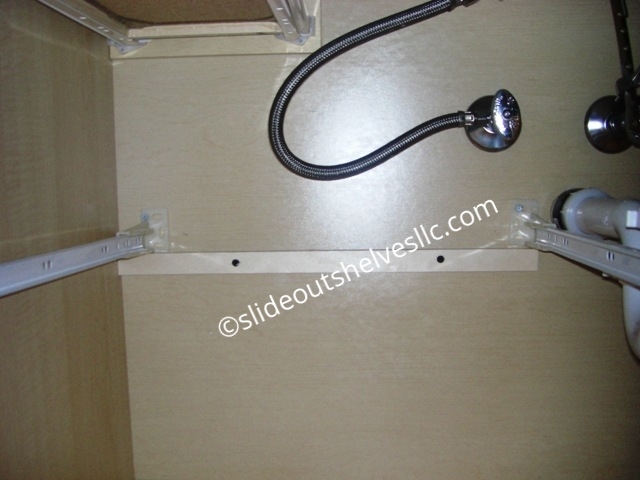 shelves all excellent in quality and appearance, and they work perfectly. order delivery time outstanding. 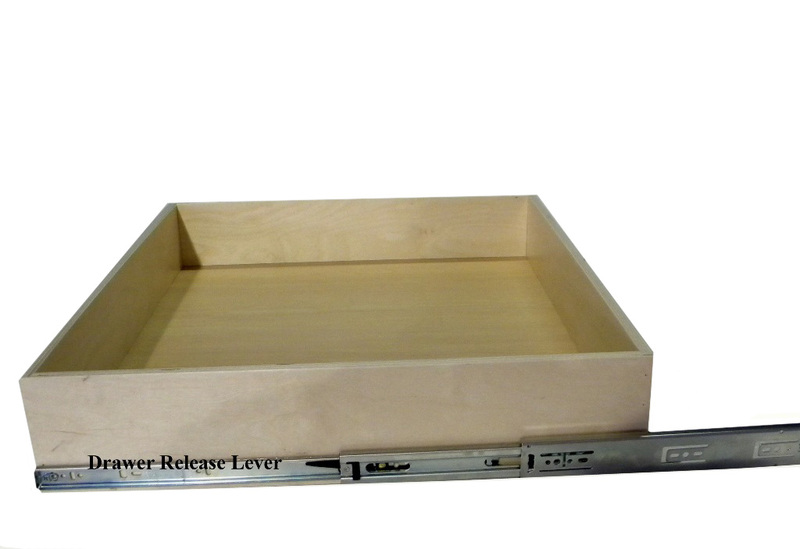 I ordered a few of these, full-extension soft-close, for a floor to ceiling linen cabinet in one of my bathrooms. They are perfect for stacking towels, making the ones in back easy to reach. They are heavy-duty construction and made with precision. If you take the time to consider all of your options and triple check your measurements, you won't be disappointed. 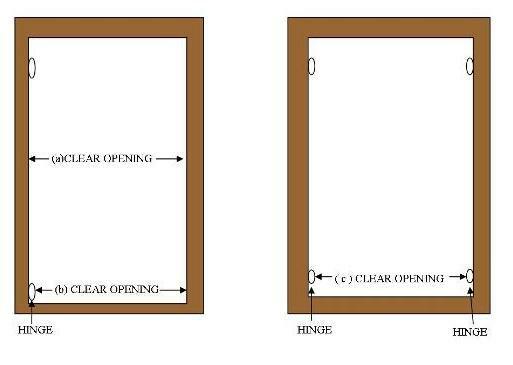 Read the measuring guide and follow the instructions. Call if there is ANY doubt. I did, and was very pleased with the knowledgeable and personalized service. My cabinet is 24 inches deep, so I had to the side mount. Rear socket would have been much easier. Building out the sides of the cabinet to exactly the right depth for each of the 6 shelves was a pain, especially since no part of the cabinet is really square or straight. But with perseverance, my husband and I got it done, and now they are a storage solution that will last a very, very long time. Female friends and family are envious of my huge bathroom closet/cabinet, where EVERYTHING is accessible! 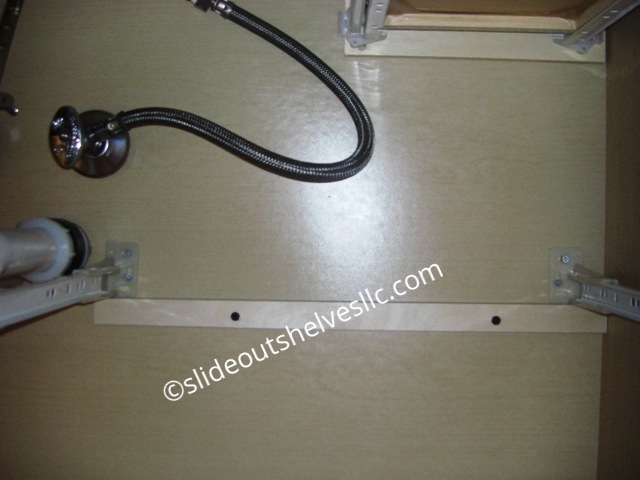 The pull-out shelves we purchased are high quality and were easy to install. The online ordering process was simple and the helpful and courteous staff answered initial questions I had about the shelves. I researched many options and believe these shelves provided the best combination of quality and price. Absolutely LOVE my Pull Out Kitchen Selves! There was so much wasted space in the lower cabinets because I couldn't even see all the way to the back - I had boxes in the kitchen with canned goods and storage containers in them because I couldn't get them into the cabinets. The shelves made almost every inch of the cabinets useful. Everything fit with room to spare! Shelves matched dimensions perfect, all hardware attached. Installation guide easy to follow, although I actually didn't read until installed, just check I did it right. Took only one week to arrive after order. Great quality materials and finish. As good or better than friends who paid 4x as much to have professional installation. I waited way too long to order these shelves. Makes life so much easier to find things in my pantry cabinet. Wish I had done it a lot sooner. Easy to install. I ordered three shelves. They're nicely made and sturdy. Overall, great product. 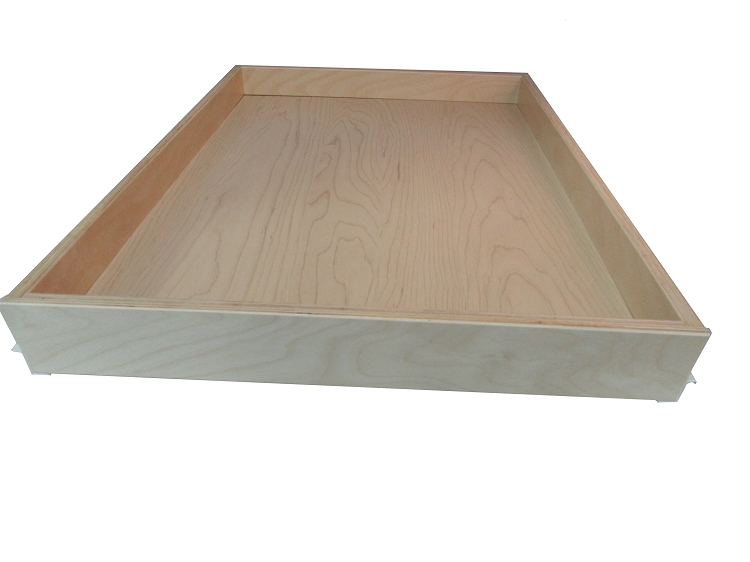 Best pull out kitchen shelves we have ever had and with discounted pricing. I could not be more pleased with your product. 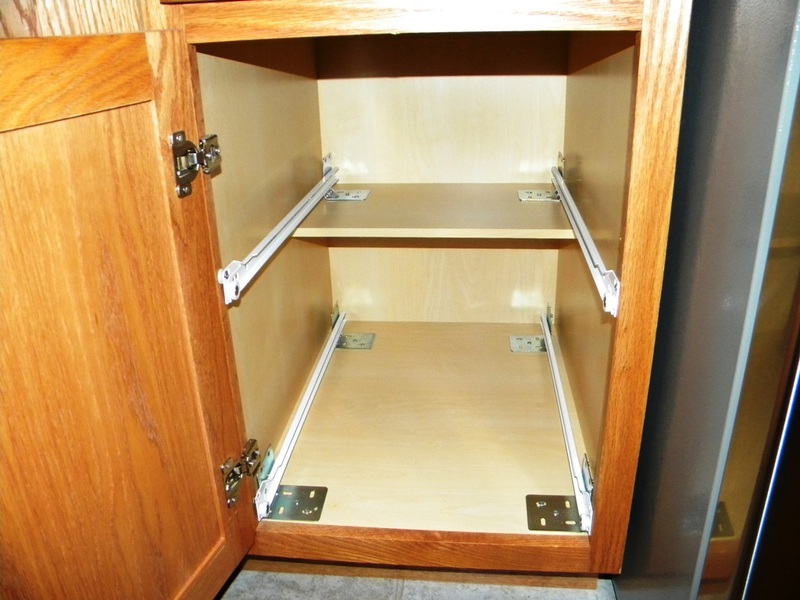 It has made a real big difference in the use of storage in our kitchen cabinets. Thank you so much for everything. Shelves work very well and look professional. Easy to install as well, very pleased with my purchase.